Anything larger then this never achieves mass production. 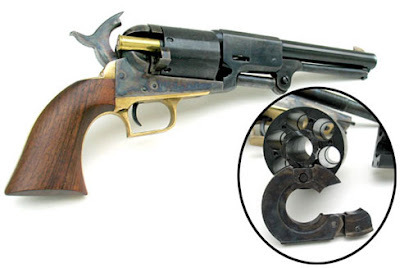 At 4 pounds, 8 ounces, the Walker weighs nearly twice as much as nearly all large revolvers, ancient or modern. The massive weight put it into holsters carried by the horse instead of worn by the man. It could be loaded with as much powder as was used in some muskets. Like the other Civil War cap and ball revolvers, it is fired with percussion caps. It was more powerful than any other revolver of its day, and is more powerful than most modern pistols.